Last week I looked at our family calendar and noticed it was Zach’s snack week. It was also the week for the letter R in their Letter of the Week plan and Valentine’s day. I got super excited about these opportunities. A few years ago I had made these Smitten Kitchen cheese crackers for a school snack and the kids loved them. They are pretty easy; everything goes into the food processor, you roll it out, cut the shapes and bake. They are healthy and filling, it is a win-win. 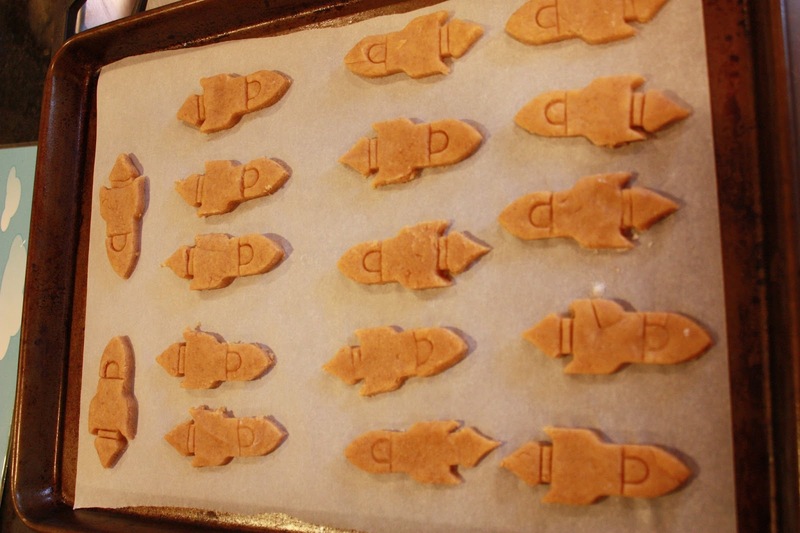 Since it was the letter R week I scoured my cookie cutter collection for anything that started with an R. I had exactly three: a letter R, a rocket and a rabbit. Embarrassing. I tried the letter R first and it was a disaster. It is a smallish cutter and I could not keep the dough together. Next I tried the rocket and it was perfect. You need something with indentations or the crackers get really puffy. I went ahead and tripled the batch as I had noted on my printed copy to “double it – not worth the trouble for one batch”. I was feeling very, very smug when my 40 crackers came rolling out of the oven. I even cut some into hearts for my little family. So in we head on Monday morning when I notice Tony’s dad putting down a bag of snacks on the table in their room. We always follow Tony on snack week and I had gotten confused. Our was next week, with the letter S not R and not Valentine’s day…I was decently devastated. Tony is a total prick and starting snipping at Zach about how it was HIS week not Zach’s week. I had to pull Zach away and explain to him that it was all my fault and our week was next week and we would make Tony pay. Just kidding on that last part. Sort of. I left the rocket crackers there anyway, they don’t keep and what was I going to do with 40 crackers? To add insult to injury, they only ate half of them so like taunting boomerangs, back they came to me. So naturally I sent them to James’ baby class where they were highly appreciated. That made my day Jan!